Like its predecessors, the new enemy thrust had little chance of success. Although the Japanese were powerfully outnumbered and outgunned at all times, they had the opportunity to concentrate their forces and counterattack in signficant strength. Why they failed to mass their resources remains a puzzle. The Target Hill assault force continued to fit the pattern of being too small to achieve results worth the cost of the effort. For the first few days of the BACKHANDER operation, enemy intelligence officers at Matsuda's headquarters seriously underestimated the size of the Allied landing force, a fact which may account for the limited number of troops committed against Frisbie's and Masters' positions. There appears to be little reason to believe, however, that Colonel Katayama was ignorant of the real strength of the BACKHANDER Force when he selected a reinforced rifle company as the spearhead of his Target Hill assault. Any lingering doubts that he may have held regarding Allied strength must have been dispelled on 2 January when General Shepherd launched an attack to drive the Japanese back from the Marine lines. For 300 yards, the two assault companies of Lieutenant Colonel Williams' battalion hacked and dodged their way through the jungle, trying to keep contact and watching warily for the first sign of the Japanese ahead. As they approached the banks of a little stream that cut through 2/7's line and extended on a north-south axis across the zone of advance, enemy small-arms fire sprayed the front. The Marines of 3/7 dived for cover, returned the fire as best they could against unseen targets, and began to inch their way forward. On the right of the developing battle, 3/5 had to cut its way through dense fields of kunai grass during most of the morning's advance. Patrols ranging south from the open flank found no evidence of enemy troops on the rising mountain slopes. As Lieutenant Colonel McDougal's battalion left the grassy area and moved into the jungle toward the sound of the firing, its lead platoons also encountered the Japanese defenses. By midafternoon, the Marines had formed a line along the west bank of the stream, already called Suicide Creek, which bordered the enemy position. What lay ahead was a nightmare for the attacking infantrymen. The Japanese had dug foxholes and bunkers under the arching roots of the forest giants and amidst the thick intervening brush, camouflaging the whole position so that no trace of it was revealed. Interlocking fire lanes gave enemy gunners enough of a view of ground to their front and flanks to provide targets and yet were almost impossible to detect. The few yards of open area over the stream bed was a killing ground without any concealment for the attackers. 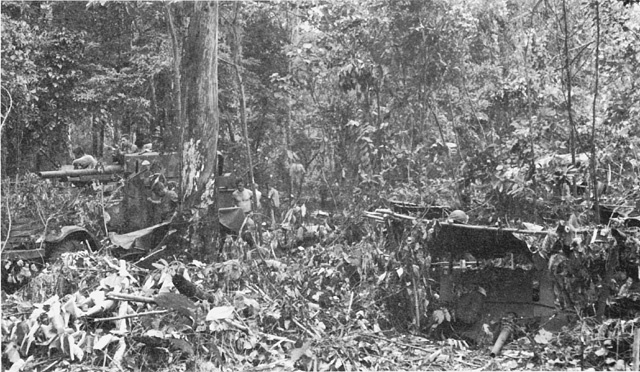 Most of the Marines' supporting artillery and mortar fire burst in the canopy of leaves and branches far overhead and had little effect on the hidden and protected enemy below. 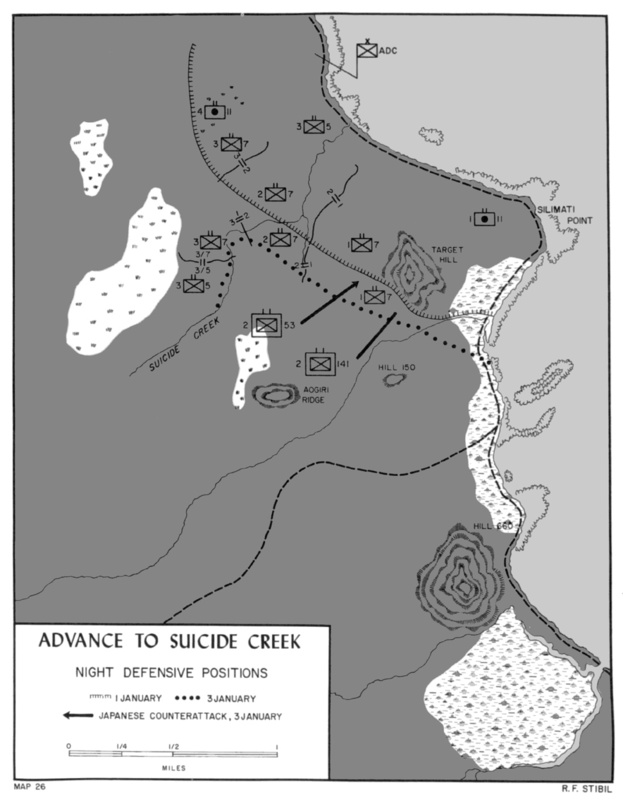 Suicide Creek was aptly named, and, for the night of 2-3 January, the Marines dug in at approximately the same positions they had held when the Japanese first opened fire. All attempts to rush the enemy had failed; the volume of defending fire was so heavy that most of the assault troops spent the afternoon pinned to the ground. The man who rose to advance inevitably became a casualty. now extract grim payment for the punishment it had received in a week of futile attacks of Combat Team C's perimeter. Takabe's part in the planned counterattack on Target Hill was to create a diversion by an assault on 2/7's lines, a tactic that failed miserably in the face of the Marine battalion's practiced defensive measures. Equally unsuccessful was the main event. The 5th Company of 2/141, supported by the direct fire of 20mm cannon and machine guns firing from positions in the jungle at the base of the hill and of 75mm guns emplaced near Hill 660, was to seize the crest of the hill. The unit defending, 3d Platoon, Company A, 1/7, was ready when the assault came. Long before the Japanese actually started up the lower slopes, the Marines on the narrow nose of the hill above the point of attack could hear the enemy soldiers cutting steps into the steep base of the hill which was hidden in the jungle growth. The 1st Battalion's mortars, in position back of the height, could not bear on the Japanese as they were actually as close as 20 yards to the Marines above them. The Japanese mortars and grenade dischargers were not hampered by the same limitation, and enemy shells landed all over the hill during the night to cover the attack preparations. The prize of the night's action was the documents taken from the body of the Japanese company commander who fell attacking the Marine machine gun position. The papers helped the ADC's Intelligence Section fill in gaps in the order of battle and gave them a pretty clear picture of the movements of the troops opposing them. A fragmentary order signed by this officer, and picked up from the body of one of his platoon leaders on 4 January, gave the Marines their first inkling of the existence of Aogiri Ridge, a formidable defensive position that guarded the trail over which most of the Japanese were reaching the battle area. An accompanying rough sketch with this order gave the approximate location of both ridge and trail, but the ADC observation post on Target Hill could not pinpoint either in the maze of jungle ahead of the Marine lines. Before Aogiri Ridge became a pressing problem, however, the Japanese had to be driven back from Suicide Creek. The repulse of the counterattack on Target Hill evidently had no effect on the defenders of the enemy position east of the creek, and the volume of fire stemming from the hidden bunkers showed no sign of let-up when the American assault was renewed on 3 January. During the morning, Marines of 3/7 were able to get across the creek to the flanks of the main Japanese defenses and 3/5 closed in similar manner from the southwest, but neither battalion could exploit its advantage. The attack stumbled to a halt in the face of determined opposition. Some weapon heavier than a rifle or a machine gun was needed in the forefront of the attack, preferably tanks, if they could be gotten to the front. The engineers of Company C, 1/17, were equal to the challenge of getting the armor forward, and, in a day of incredibly hard labor, built a corduroy road across the coastal swamp to the kunai fields. Late in the afternoon of the 3d, three medium tanks of a platoon that had been dispatched from the airdrome crashed through the brush and trees to a point opposite the center of Japanese resistance. Before the Shermans could attack, however, the engineers had to cut a passage through 12-foot high banks to enable the tanks to cross the sluggish stream. The Japanese shot two drivers out of the seat of an unarmored bulldozer that came up to dig its blade into the bank and shove the dirt down into the water. A third engineer volunteer was able to operate the machine, crouching in its shelter and moving the controls with a shovel and axe handle. By nightfall, the way was clear for a tank-led attack. On the morning of the 4th, after artillery had fired a preparation, the first medium eased its way down the earthen ramp, churned through the shallow water, and nosed up the far bank right into the heart of the enemy position. Covering Marine riflemen cut down two Japanese who attempted to lay explosives against the tank, and the rest of the battle was almost easy. Like grim executioners, the tank-infantry teams expertly destroyed the dug-in defenses with point-blank cannon fire, the crushing action of weighty treads, and the reaper-like spray of bullets from small arms which caught the few Japanese who escaped burial in their emplacements. After pausing to reorganize, the two assault battalions swept forward nearly a thousand yards to seize an objective line in the jungle that would serve as a line of departure for the next phase of General Shepherd's attack. Japanese opposition was negligible during the day's advance, after the reduction of the Suicide Creek defenses. The forward movement of 3/7 masked 2/7's old position, and, on order from Colonel Frisbie, the 2d Battalion advanced, across the trace of the attacking Marines to reach the right flank and tie in with 3/5. As Lieutenant Colonel Conoley's unit moved through the web of defenses that had been dug in facing the beachhead perimeter and the creek, 115 enemy dead were counted. 2/53 and 2/141, were down from strengths of about 500 men each to 147 and 324, respectively.6 The losses of attached units for this period are not known, but were logically on a comparable scale. The 53d's 2d Battalion had been badly chewed up by 2/7 in the first few days after the landing, and Suicide Creek left its companies with an average strength of 22. Except for the losses of its 5th Company at Target Hill, the 141st Infantry was still pretty much intact. The Marines lost comparatively few men on 4 January when they advanced with the support of tanks, but their casualties in the previous two days of fighting were heavy. The combined losses reported by the 7th Marines and 3/5 were 36 men killed, 218 wounded, and 5 missing in action.7 The cost promised to be just as great in future days' actions whenever the Japanese chose to hold prepared defenses in the jungle. Characteristically, the enemy showed no lack of a will to fight, even in a hopeless cause. Captured diaries and letters of Japanese soldiers who fought at Cape Gloucester show that most of them knew they were cut off from effective support by the remainder of New Britain's garrison. Nightly raids by a few Rabaul-based planes which occurred for the first few weeks after D-Day seem to have given little lift to enemy morale. In fact, since antiaircraft fire kept the pilots flying high and erratically, their bombs fell as often within the Japanese lines as they did inside the American. Several Marines were killed and about 30 were wounded by bomb fragments when they were caught in the random pattern of hits. The support the Matsuda Force needed was not nuisance raids by a few scattered bombers, but a steady influx of men, rations, guns, and ammunition. The few Japanese barges that attempted to sneak into the eastern end of Borgen Bay to land supplies were sunk by Marine artillery. On the southern coast, Allied attack planes and torpedo boats kept the barge route permanently closed. The pittance of supplies brought forward along the north coast trail by Japanese and native carriers was not enough to sustain the troops opposing the 1st Marine Division. The average enemy soldier fought with his stomach gnawingly empty, his clothes and shoes sodden and rotting away, and his body attacked by jungle diseases. Despite the circumstances, discipline and national pride made the Japanese capable of an impassioned defense. There were no cheap victories to be had at Cape Gloucester. The principal objectives of the 6 January attack were a small hill, Hill 150, due south of Target Hill in 1/7's zone, and the mysterious Aogiri Ridge, which might be in either 2/7's or 3/5's path. Since the jungle ahead of the Marines showed no prominent rise between Hills 150 and 660 along the coast and the mountain slopes inland, the consensus was that Aogiri would be found in a southwesterly direction toward the mountains. This guess, although logical, was inaccurate. Aogiri Ridge proved to be only a thousand yards west of Hill 150 and dead ahead of 3/5. A meandering, nameless stream which crossed the whole front of 1/7 coursed through the low ground between the two Marine objectives. Colonel Katayama, commanding the Japanese troops directly opposing the advance, numbered his remaining combat effectives at 1,320 men. About 550 soldiers, most of them members of the 2d Battalion, 141st Infantry or survivors of 2/53, held a line of defenses that protected the trail to Nakarop. Dug in on Aogiri Ridge itself were the men and machine guns of one company of the 39th Field Antiaircraft Battalion. In reserve, Katayama held another 520 men, including regimental headquarters and heavy weapons units and the weak companies of the uncommitted 3d Battalion of the 141st. Hill 660 was defended by antiaircraft units reinforced with rifle sections from the 6th Company of 2/141. All through the 5th, Marine artillery fired on possible concentration points and suspected defensive positions in the area ahead of the American lines. In very few cases could the results of preparatory fire be observed; if shells did not burst in the tree tops, they exploded out of sight below, amidst the brush. The men manning the vantage points on Target Hill and observers in planes overhead were seldom able to do more than determine that the right area had been hit. On 2 January, the 1st Division's own light aircraft, which had been intended for use in spotting artillery fire, began operating from a strip on Airfield No. 1. The makeshift air-ground radios with which the planes were fitted proved to be next to useless; the unit commander declared that the radios "petered out as soon as you got them more than two or three miles [from base]. "10 As a result, the airborne spotters either reported what they had seen on landing or dropped a message to the nearest artillery battalion. Fire control from the air proved to be an impossibility with the communications equipment available. The planes of the Fifth Air Force that flew strikes in support of the attacking Marines had even greater difficulty than the artillery spotters in locating targets. From a fast-flying plane directly overhead, the jungle in the Borgen Bay region had the appearance of an undulating sea of green with few prominent landmarks to guide strafing and bombing runs. Most air attacks were directed at objectives designated by map coordinates, but occasionally high explosive and smoke shells were used to pinpoint targets for pilots.11 The BACKHANDER Force's requirement, that most bombing take place at least 500 yards from the nearest friendly troops,12 usually limited air support to destruction and interdiction missions aimed at points well back of the Japanese defenses immediately facing the Marines. On 6 January, before the assault companies advanced, two squadrons of B-25s hit smoke-marked targets that included possible reserve assembly areas, routes of approach to the front, and what was hoped to be the particular stretch of jungle that hid Aogiri Ridge. The Marines opened the next phase of their attack with a general advance that began at 1100 on the 6th, following a 15-minute preparation fired on Hill 150. On the left flank, Company A of 1/7 waded across the stream at the foot of Target Hill and advanced until it was stopped by heavy small-arms fire crackling from a road block on the coastal trail. Patrols had discovered the block on the previous day, and tanks were moving close behind the assault infantry to take care of it. When the lead tanks, fearing that they would bog down in its muddy bottom, hesitated at the banks of the stream, a Weapons Company half track splashed ahead through the water and showed the way. The Shermans followed and their 75mm guns made short work of the enemy positions. Freed by the armor's fire, the troops on the left of 1/7 continued to advance across ground that became increasingly swampy. In the afternoon, Company A seized a trail junction at the coastal track; the path leading inland appeared on no Allied maps. The troops moving in the center of the 1st Battalion's attacking line discovered stretches of this unknown trail, too, after they had swept over Hill 150 against surprisingly light resistance. The monsoon season's heavy rains had virtually destroyed the trail and it seemed to disappear in the swamp as it led west. Except for the brief fight at the trail block, the advance of the left and center of 1/7 was held up more by the waterlogged terrain than enemy opposition. Company C on the right of the battalion's line, however, was met by a wall of fire coming from hidden positions as it attempted to push through the jungle lowland to the west of Hill 150. No effective progress could be made and the attack stalled. The 3d Battalion, 5th Marines ran up against what appeared to be a continuation of the same strongpoint. The men of 3/5 could not locate the origin of the defensive fire and were forced to dig in for protection soon after crossing the morning's line of departure. Towards nightfall, as the assault troops ceased the day's fruitless attack, elements of 3/7 were committed to cover a gap that had opened between 1/7 and 3/5. mortar fire. The units on the flanks that attempted to turn the Japanese position found terrain, densely forested swamp and gully, that heavily favored the defenders. Soon the Marine lines resembled those at Suicide Creek, but the enemy stronghold which formed a slight salient was far more extensive than the one encountered in the fighting on 2-4 January. During the hottest part of the day's action, Lieutenant Colonel McDougal was shot while he was up with his assault platoons. General Shepherd immediately asked division to send a suitable replacement. Major Joseph S. Skoczylas, 3/5's executive officer, who took command when McDougal was wounded, was hit himself later in the afternoon. Pending the arrival of a new commanding officer, Lieutenant Colonel Puller was ordered to take charge of 3/5 as well as 3/7. The following morning, Lieutenant Colonel Lewis W. Walt, who had just been appointed executive officer of the 5th Marines,13 reached the front lines and assumed command of the 3d Battalion, 5th. When the Marines attacked on 8 January, there was no let-up in the vicious, blind struggle. Units on the flanks of 3/5 made little progress against their unseen, dug-in opponents. The assault companies of Walt's battalion found the jungle undergrowth to their front became, if anything, more dense and tangled, while the enemy fire grew in intensity. As the men inched forward, they could feel the ground slowly rising beneath their feet, although no hill or ridge was visible in the dank jungle ahead. Walt was convinced he had discovered Aogiri Ridge by the time he pulled his battalion back to more secure night defensive positions. The ADC reported at 1800 that the previous 24 hours of fighting had cost his command casualties of 15 killed, 161 wounded, and 5 missing in action. No one could estimate accurately how much the defenders had suffered in the return fire. The day's main attack was delayed until 1630, while the 37mm was brought forward15 and a heavy artillery preparation was laid down on the area which seemed to contain the fortress ridge. Two flanking attacks were mounted against the eastern side of the Japanese position as 3/5 inched ahead in the center. In the first assault, Company C of 1/7 destroyed two bunkers before a rising tide of defensive fire overwhelmed its further attempts to advance. The second attack, an enveloping movement made by Companies K and L of 3/7, which General Shepherd had attached to Walt's command, also sputtered to a halt as the Japanese beat back the threat to their rear areas. The wedge-shaped position that Walt's battalion occupied on the forward slope and crest of the ridge was a precarious hold, indeed. On both flanks the Japanese still occupied some of the 37 interconnected bunkers which lined Aogiri's military crest. On the reverse slope, a second line of enemy positions had yet to be taken. The import of the Marine penetration was clear, however, and the Japanese had little choice but to counterattack and hurl back 3/5. Failing this, Aogiri Ridge was surely lost. yards from where the Marines crouched in their holes. At the height of this attack, a Japanese major broke through the front lines and almost reached Walt's position before he was killed by fragments from a short round of artillery fire bursting in the trees overhead.19 The remnants of the enemy force which had started the fifth counterattack wilted and ran in the face of fire from rifles and machine guns that took up the fight where the artillery ceased. With dawn, the battle was over and not a single Japanese remained alive to defend Aogiri Ridge, soon renamed Walt's Ridge by the division commander. During the night's attacks, most of 3/141, Colonel Katayama's only strong reserve, had been committed against the Marines; the enemy major who had died leading the fourth attack was apparently the battalion commander. At 0800, the men of 3/5 rose out of their foxholes and walked forward down the ridge, threading their way through scores of bodies sprawled in the awkward poses of those who had died violently. There was no opposition to the advance, and the section of trail behind Aogiri which the Japanese had fought so desperately to hold passed easily into Marine hands. After the fall of the ridge, only one pocket of resistance remained, the defenses that had held up the units on the right flank of 1/7 through four days of dogged struggle. Elements of the 2d Battalion, 141st Infantry were fighting to the last man to protect a supply dump that lay along the trail where it passed through the lowland between Aogiri and Hill 150. On 10 January, Lieutenant Colonel Weber's assault units kept probing the enemy position but could make no headway without incurring heavy losses. Even when a platoon of light tanks and two half tracks were finally able to reach the front on the 11th, tank-infantry teams had to fight at close quarters for four hours before the last Japanese soldier died in a futile effort to hold his ground. Once the pocket was wiped out, 1/7 surged forward to straighten out the Marine line which stood poised before the campaign's last major objective, Hill 660. Marine patrols were active all along the front on 12 January trying to fix the limits of the next Japanese defensive position. No enemy troops were encountered along the coastal track short of Hill 660, and none were met at all by scouts who travelled almost a mile beyond Aogiri Ridge along the trail to Nakarop. Behind the screen of patrol activity, the units chosen to make the assault on Hill 660 rested and refitted. An important role in the pending attack was assigned to a task force organized under Captain Joseph W. Buckley, commanding officer of the 7th Marines Weapons Company. The force was composed of two light tanks, two infantry platoons from 1/7, a 37mm platoon and two 75mm half tracks from Buckley's company, a pioneer platoon with a bulldozer from 2/17, and one of the Army's rocket DUKWs. Buckley's command was to advance down the coastal trail and establish a road block between Hill 660 and Borgen Bay, thus cutting the most favorable escape route for enemy defenders. From captured documents, prisoners of war, and battlefield identifications, the ADC intelligence section had built up a pretty fair picture of what Japanese opposition might be encountered at Hill 660. The strength of the heavily armed roadblock force was considered sufficient for it to hold its own against anything the enemy garrison might try. The looming hill was too big a target to miss, and bombers, artillery, and mortars all had a field day during the preparatory bombardment. When the Marines moved out at 0800 on the 13th, however, the hill's cover of jungle hid most of the scars of the pounding it had taken. The infantrymen approaching 660 were too experienced to expect that the shells and bombs had done much damage to the Japanese burrowed into the ground beneath the thick foliage. Lieutenant Colonel Buse's battalion advanced in a column of companies with Company I in the lead. The tanks, which started forward with the assault platoons, were soon left behind bogged in the mud, and the infantry continued without armored support. Company I reached the foot of Hill 660 along its northwest slopes at about 0930, and immediately started through a ravine cluttered with brush and boulders that rimmed the base. As the Marines climbed up the hill proper, they found the slopes so steep that many of them had to sling their rifles and pull themselves upward, seizing holds in the wet undergrowth and clawing their way in the slippery mud underfoot. Suddenly, right in the face of the struggling climbers, the Japanese opened fire with machine guns and rifles from the undergrowth above. The advancing line of skirmishers could do little but fling themselves down and try to work into a position to return the fire. Lieutenant Colonel Buse sent Company L around to the right of Company I in an effort to outflank the enemy defenders, but all attempts of this sort failed. The Japanese positions stretched around the hill were sited for mutual protection, and Company L was eventually stalled on the lower slopes. One enemy machine gun was able to lay a band of fire behind the Marines on the hill and the two companies were pinned down front and rear. When engineers were finally able to work a light tank forward to the lip of the ravine in midafternoon, its covering fire, together with artillery and mortar support, enabled the stranded Marines to pull back to more defensible night positions. While 3/7 had not been able to accomplish much during the day's action, Captain Buckley's command was successful in attaining its objective. The pioneers' bulldozer with the task force performed yeoman service helping move the various vehicles through the deepest mud on the coastal track. By 1030, the roadblock was set up, and Buckley had his men digging in for all-around defense on a 100-yard wide stretch of flat land between the bay shore and a swamp that edged the southern face of Hill 660. During its approach to the objective, Buckley's column was fired on by a nest of automatic weapons located near the crest of the hill. The enemy guns were laid to cover the coastal track and were in defilade positions in relation to the Weapons Company half tracks in the roadblock. Although the Marine 75s could not place direct fire on the troublesome weapons, their high explosive shells hit close enough to drive the Japanese crews away from their pieces whenever it was necessary. With the aid of the half track's suppressive fire, wire crews were able to run a line through to the roadblock from the ADC's command post. After an uneventful night during which 1/11 peppered Hill 660 with harassing fire, the pack battalion and 4/11 fired a 1,200-round preparation to pave the way for 3/7's attack. Buse's assault elements descended into the base ravine at 0900 and began climbing the hillside, advancing very slowly against determined opposition. As they had on the 13th, the Marines kept working their way around the hill feeling for a soft spot in the Japanese defenses. Tanks were able to follow and deliver supporting fire until they were stopped by two deep ravines that cut the southern slope. Despite the loss of tank support against the enemy machine gun positions, the attacking infantrymen kept moving upward, gradually driving back the Japanese. The ground rose so steeply near the hill top that some assault units had to haul themselves up hand over hand to reach the summit. Fortunately, Marine 60mm mortars were able to silence most of the enemy cannon and machine guns that were clustered in open emplacements on the hill crest before they could do much damage. Riflemen of 3/7 attacking behind the lethal shower of mortar shells quickly scattered the remnants of the defenders in headlong flight down the hillsides. 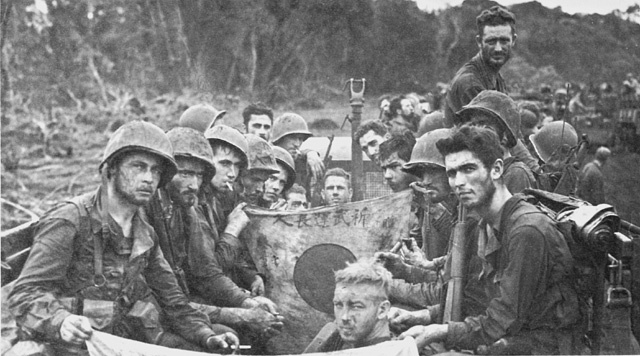 Some of the retreating Japanese ran directly into the sectors of fire of Buckley's roadblock; others took refuge in the swamp. Buse's battalion was clearly in possession of the important ground on Hill 660 as dusk approached. heavens opened up and a drenching rain flooded down. All night long the torrent of water fell, soaking the weary men who had climbed and fought through a hot, muggy day. But if it made the life of the victors miserable, the rain also prevented the Japanese from gathering their force for an attack to regain the hill. At 660's base, the Marines in Captain Buckley's roadblock had a lively night. Small groups of enemy stragglers kept trying to go through or around the American position and were either driven off or killed. Twelve Japanese soldiers were shot down attempting to wade through the offshore waters, and two were killed who ventured too close to the cleared fields of fire of the Marine guns. The enemy activity died away with the coming of daylight and the end of the shrouding rain. On the 15th, the Marines were treated to a spell of clear weather and sunshine. Most men rested, while combat patrols ranged the brush on the sides of Hill 660 hunting down the Japanese trapped within the American lines. Only a few scattered enemy were caught in the mopping up activity, and there appeared to be no indication that large forces were in the vicinity to threaten the Marine position. As a reasonable precaution, however, additional automatic weapons were brought up to 3/7's front lines and emplaced during the day. The Japanese were not ready to give up Hill 660 without at least one thrust at the men who had driven them off it. A counterattack force, largely made up of the 6th and 11th Companies of the 141st Infantry, gathered in the swamp south of the hill during the daytime hours of 15 January and then moved forward quietly to the base of the hill well after dark. Finally, at 0630 on the 16th, the enemy troops began a screaming, scrambling charge up the precipitous slopes to get at the Marine positions. The first few soldiers to the top fought at close quarters, but the tremendous volume of defensive small-arms fire drove the Japanese back and pinned them down, as their own fire had once slowed the Marines attempting to take the hill. As soon as he had the enemy cleared away from in front of 3/7's lines, Lieutenant Colonel Buse ordered the rifle companies' 60mm mortar sections to hit the front of the enemy formation while the battalion's 81mm platoon fired on the rear. Then, in a deadly squeeze, the impact areas were moved toward each other. The attack and the attackers died in a welter of mortar explosions. Patrols on Hill 660 found 110 fresh bodies after the last gasp of the counterattack had faded. Captain Buckley's roadblock crew had wiped out 48 more Japanese in repulsing a weaker effort to overrun their position. Altogether, the three days of action swirling about Hill 660 had cost the enemy over 200 dead and an unknown number of wounded. The cost to the Marines was about 50 men killed and wounded. 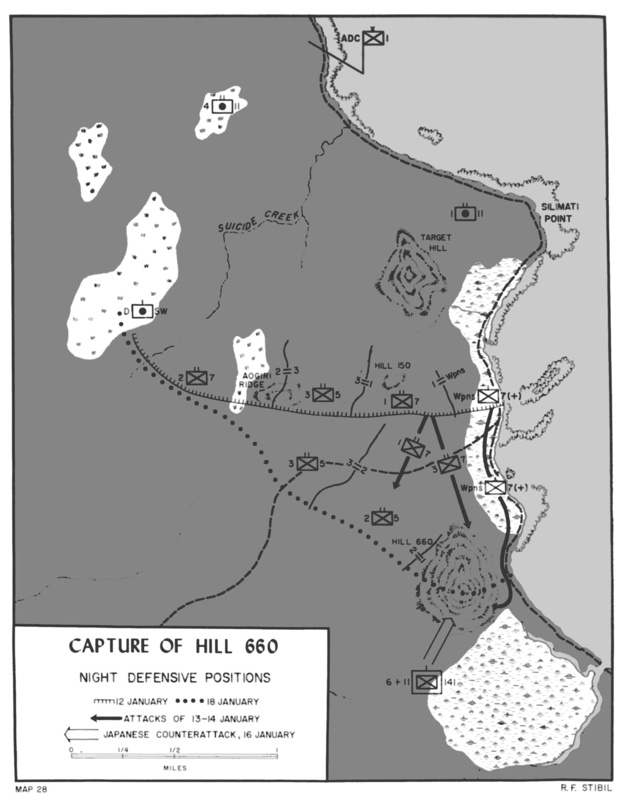 The capture of Hill 660 and the repulse of the counterattack to retake it marked the effective end of the Japanese defense of the Cape Gloucester-Borgen Bay area. In the following months, the Matsuda Force was to try with increasing desperation to escape from western New Britain, while the BACKHANDER Force kept pressure on the retreating enemy troops. 1. Unless otherwise noted, the material in this section is derived from: 1st MarDiv SAR, Phase III, Extension of Beachhead Perimeter and Capture of Hill 660; 1st MarDiv D-3 Jnl-I; Col John E. Weber ltr to HistBr, G-3, HQMC, dtd 27Mar52; LtCol Marshall W, Moore ltr to HistBr, G-3, HQMC, dtd 27Apr52; Hough and Crown, New Britain Campaign. 3. Luckey, "Cannon, Mud, and Japs," pp. 52-53. 4. Quoted in McMillan, The Old Breed, p. 192. 5. AET 2026, ATIS AdvEch No. 2, dtd 18Feb44, MatsudaFor MedSect Casualty Repts, 26Dec43-20Jan44 in ADC IntelDocuments. 6. AET 2026, ATIS AdvEch No. 2, dtd 18Feb44, MatsudaDet StfTele A No. 270 to CofS, 17th Div, dtd 7Jan44, in ADC IntelDocuments. 7. 7th Mar R-1 Jnl, 27Oct43-26Mar44, entries of 2-4Jan44. 8. Unless otherwise noted, the material in this section is derived from: 1st MarDiv SAR, Phase III, Extension of Beachhead Perimeter and Capture of Hill 660; 1st MarDiv D-3 Jnl-I; ADC IntelDocuments. Col Lewis W. Walt comments on draft of Hough and Crown, New Britain Compaign, dtd 4Mar52; Hough and Crown, New Britain Campaign. 9. The regimental executive officer took over the battalion on 4 January when Colonel Frisbie relieved its commanding officer. Puller held temporary command until 9 January when Lieutenant Colonel Henry W. Buse, Jr. took over 3/7. 10. Maj Theodore A. Petras interview by HistDiv, HQMC, dtd 11Apr50, p. 3. 11. Craven and Cate, Guadalcanal to Saipan, p. 343. 12. BACKHANDER TF Cir No. 1-43, dtd 9Nov43, Subj: Air Force and Target Bomblines, in ALAMO G-3 Jnl No. 3. 13. The regiment's former executive officer, Lieutenant Colonel William K. Enright, was appointed Assistant D-3 on 7 January as a replacement for Lieutenant Colonel Buse who was slated to take over 3/7. 16. 1st MarDiv SAR, Phase III, p. 10. Actually, the gun was already in position to support the attack and had fired three times before Japanese return fire cut the crew down from nine men to four. Walt called for volunteers to help push the gun forward, and when none were forthcoming, he and his runner crawled up to the gun and put their shoulders to the carriage with the others. Two more shots cleared a tunnel through the growth ahead; a sixth shot silenced an enemy machine gun. Several volunteers then joined the group pushing the gun and there was a general surge forward. Walt ltr. 18. Luckey, "Cannon, Mud, and Japs," p. 54. 20. Western New Britain, dtd 11Jan44, in ALAMO G-2 Weekly Rept No. 23, dtd 13Jan44, in ALAMO G-3 Jnl No. 16. 21. Unless otherwise noted, the material in this section is derived from: 1st MarDiv SAR, Phase III, Extension of Beachhead Perimeter and Capture of Hill 660; 1st MarDiv D-3 Jnl-I; Hough and Crown, New Britain Campaign. 22. The locations of the front line and boundary lines shown for 12 January on this map, taken from the division periodic report and a similar map done for Hough and Crown, New Britain Campaign, have been questioned. According to the former commander of 3/5, the boundary between his battalion and 2/7 was 500 yards east of Aogiri Ridge, and the front line was generally 1,500 yards forward of where it is shown. Walt ltr.